Chocolate is an indigenous South American food. Traditionally, the bean of the cacao tree was brewed with hot water, producing a bitter drink often mixed with dried chili peppers. Adding sugar to create the hot chocolate that is drunk today, and adding fats to create chocolate candy, occurred in Europe in the 16th and 17th centuries. Chocolate can create a sensation of well-being and alertness, but it can also cause migraine headaches in some people. 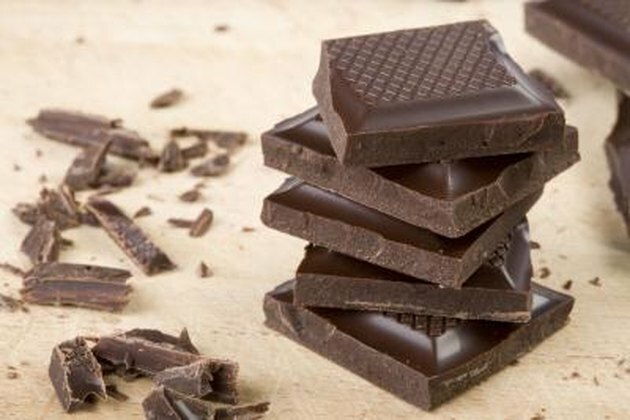 Dark chocolate contains the chemical tyramine, which has been found to trigger migraine headaches in the majority of migraine-prone subjects tested in some studies, according to the Clemson University Extension. Phenylalanine, another component of chocolate, has been shown to trigger migraines in about half the migraine-prone subjects in another field study, according to the University of California Nutrition Bytes. Additional studies on both of these chemicals have yielded variant, inconclusive results. Keeping a food diary to determine personal migraine triggers may be a more effective strategy than simply eliminating foods like chocolate from consumption, according to Harvard Health Publications editor Christine Junge, as triggers seem to vary considerably from person to person. Over-consumption of caffeine may trigger migraine headaches in some individuals, according to MedlinePlus. Chocolate does contain caffeine, as well as the stimulant thobromine, but only in very small amounts. One ounce of milk chocolate has approximately the same quantity of caffeine as a single cup of decaffeinated coffee, according to the California Academy of Sciences. A person would have to eat more than 12 chocolate bars to consume the same quantity of caffeine as in a single cup of coffee, according to the University of Washington Neuroscience for Kids project. For caffeine sensitive individuals, this small amount of caffeine might trigger a headache, while regular consumers of caffeine might experience a headache if they miss their regular doses of coffee or chocolate. Eating chocolate triggers the brain to release natural opiates that dull pain and produce a happy feeling of well being, according to the Washington State University Neuroscience for Kids project. Anandamide, also a chemical component of chocolate, encourages the release of dopamine, another naturally occurring substance in the body that creates feelings of happiness. Chocolate also increases the brain's serotonin and endorphin levels. Although these chemicals are only present in very small amounts in an ordinary serving of chocolate, the positive sensations caused by dopamine and opiates released from eating chocolate may actually bring relief from minor headaches, especially those caused by tension and anxiety. Chocolate is one of the richest food sources of antioxidants, nutritional compounds that help the body fight off free radicals that damage cells. Cocoa powder and dark chocolate contain more antioxidants per serving that fruit, green tea or red wine, according to the Clemson University Extension. Eating small amounts of dark chocolate can lower high blood pressure, increase blood vessel elasticity, and help to regulate blood sugar. While most chocolate candy contains high amounts of fat and sugar, which are detrimental to consume in large quantities, consuming dark chocolate, which is lower in fat and sugar, in modest amounts can be beneficial to cardiovascular disorders that may also contribute to headaches.